Japanese Episode AG 156: "The Pokemon Ranger Enters! The Celebi Rescue Operation!!" American Episode 426: "The Green Guardian"
As Satoshi continues his journey to the Battle Tube, they find that Cycling Road, the path they had planned to take, had been closed down due to an outbreak of thorns! Our heroes are guided to a detour where Pikachu perks up its ears and takes off running. As Satoshi and his friends follow the pokemon, they are stopped Hinata, a Pokemon Ranger. Pokemon Rangers are special trainers who use a device called the Capture Styler to borrow the powers of nearby pokemon, an ability she demonstrates by finding a Massuguma and borrowing its power to cut through the vines. Meanwhile, Pikachu comes across the legendary pokemon Celebi! Celebi had created the vines to smother a fire that had threatened the entire forest, but in doing so it had exhausted all of its strength. Satoshi and the others finally reunite with Pikachu, and they all decide to help Celebi recover. The next day, an energetic Celebi makes all the vines it had created disappear, clearing the way through the Cycling Road. The Rocket-Dan appear to kidnap Celebi, but our heroes are able to send them blasting off again without any trouble. Hinata declares the Celebi Rescue Operation a success and returns to her Rangers' Base. As our heroes return to Cycling Road, they think about the time traveling pokemon and the Pokemon Ranger who helped them rescue it. The anime is, obviously, based on a series of video games. As you're well aware, all of the major games in the series get represented; Kanto = Red/Green/Blue/Yellow, Jouto = Gold/Silver, The Legend of Raikou = Crystal, Houen = Ruby/Sapphire, Battle Frontier = Emerald, and, arguably, Kanto captures like Haruka's Fushigidane and that one Housou special = FireRed/LeafGreen. But we've been seriously lacking anime representations of the side games - those B-list games that get released in between generations to tide fans over. We didn't get Coliseum or XD anime tie-ins, and there really isn't anything they could have done to incorporate games like Dash and Trozei into the anime. Mystery Dungeon got a few scenes in the opening sequence (and later, a PUSA-produced TV special), but if you really think about it, Pokemon Ranger is the first side-game since Pokemon Snap to be featured in the anime. A lot of people didn't like the whole concept of Pokemon Rangers back when this episode first aired in Japan. They rejected the idea and thought that Hinata was using mind control not unlike Vicious' Dark Balls (from the Celebi movie) or the Shadow Pokemon (from the GameCube RPG's). They argue that Pokemon Rangers enslave pokemon and then throw them out as if they were trash. The way some people described Pokemon Rangers, you'd think they were baby killers or something. It's really quite alarming. But if you really think about it, Pokemon Trainers aren't all that "wholesome," either. They remove pokemon from their natural habitat and force them to travel through strange lands, hundreds of miles away from their home. Pokemon Trainers, unlike Pokemon Rangers, expose their pokemon to all sorts of danger by having them battle one another (in contrast, Pokemon Rangers never use their pokemon to attack other pokemon). And Pokemon Trainers will use their pokemon as tools as often as Pokemon Rangers are accused of doing; Satoshi's Pigeon was only used when the trainer wanted to pop the Rocket-Dan's balloons, for example. Hinata has one of the oddest English names ever...you really can't get more bottom of the barrel than "Solana." Like Mr. Saridakis from a few episodes ago, giving a character an oddball name like that really makes the whole "making the names easier for American kids to understand" argument seem pretty weak. Her voice is ok enough even though it sounds a lot like a tougher version of Officer Jenny. And speaking of Officer Jenny, she sounds a lot like that man who played Jenny in those later Advanced Battle episodes. OK, OK, it wasn't really a man who portrayed Jenny. But it sure as hell sounds like one. Music-wise, the dub removes all the great Movie Four music that was used throughout the Japanese version of the episode, but it does manage to keep the Pokemon Ranger "theme" that's played the two times Hinata uses her Capture Styler. (which is also heard in the Deoxys movie right before Satoshi and Toh'i battle at the Battle Tower...thanks goes to Habunake for pointing that out to me). It was an unexpected piece of music to hear in the dub, and it's something I know 4Kids would have used their "talented music editors" to eliminate had they been in charge of this episode. Celebi, Plusle, and Caterpie all keep their Japanese voices. What's this? Do your eyes deceive you!? An actual EDIT!? Eh, not really. 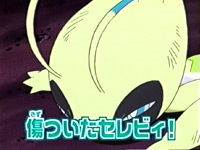 A two second fade-in to the shot of the forest before Pikachu starts making faces at Celebi is removed because of the way the commercial break falls in the English version. The TO BE CONTINUED... screen is freeze framed to make it three seconds longer in the English version.